Rash guards are an important part of the Jiu Jitsu gear. They are mostly worn by No-Gi grapplers. 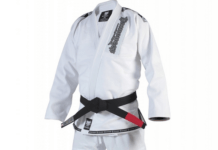 However, the use of rash guards has a lot of advantages even for Gi grapplers. Rash guards can be worn underneath the Gi. Wearing a rash guard brings multiple advantages. They have similar perks to spats due to their compression trait. For example, they offer a really good grip and help with the control of the movements due to the friction of the rash guard’s material. They also reduce the spread of bacteria, especially when worn underneath a Gi. There’s a lot of contact between you and your opponent while sparing. Using a rash guard decreases the risk of infections and skin-to-skin contact. 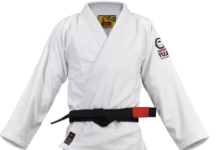 In addition, rash guards protect against mat burning and gi burning. If you really struggle with these two, a long sleeve rash guard might be better for you, compared to a short sleeve one. You’ll feel less irritation and discomfort. Interested in buying a new rash guard? 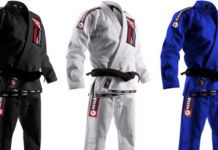 Check out our list of the Best BJJ Rash Guards. Hayabusa makes one of the best rash guards in the market. The Hayabusa Metaru Charged rash guard is one of their finest productions. It has the best comfort, durability, flexibility, and grip. This rash guard is induced with AGTM compression technology that provides the best comfort and easy mobility. The Hayabusa Metaru Charged rash guard is very carefully stitched. Therefore, it will last you a long time. In addition, this rash guard features cool dyed graphics for an amazing show-off. This rash guard is also inducted with anti-bacterial technology, which makes it very hygienic. The price of this rash guard is around $60. It is an expensive rash guard but once bought one, you won’t have to worry about buying another in the near future. It is also available in several colors. Hypnotik is well-known for its funky, bright and amazing cool designs. The Hypnotik Mifune rash guard is one their best models. It is made of polyester material, along with a very resilient fabric, which makes it durable and long lasting. Due to its moisture controlling technology, this rash guard is sweat-proof, which helps the fighter to stay dry. Alongside, this rash guard has anti-bacterial technology infused in it, which makes it hygienic. The Hypnotik Mifune rash guard is available in two colors, red and blue. The price of this rash guard is $25. Fuji is a Japanese company that is known for their good quality products. 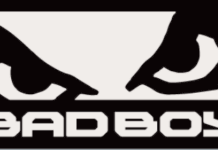 They are one of the oldest BJJ gear producing companies. The Fuji Freestyle Long Sleeve rash guard is one of their best rash guards. It’s durable, it has double stitching and it’s also good looking. It’s a hygienic rash guard since it’s infused with anti-bacterial technology. This rash guard is also available in short sleeves. 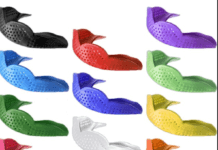 There are multiple colors available, so you can choose the one that best suits you. 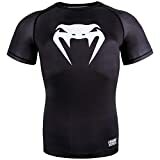 The Venum Compression T-shirt is a rash guard that has an amazing style and it features Venum’s signature snake graphic design. This rash guard is made with fiber technology, which helps to improve blood flow. Additionally, it is made of anti-odor technology, which prevents sweat odor after fighting. Often times rashguards feel heavy after being worn. This doesn’t happen with the Venum Compression T-shirt. This rash guard will ease the fighter while sparing due to its lightweight. It is available in several colors of the Venum’s graphic design. This item can even be worn in a casual wear. 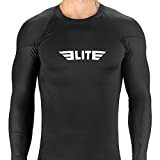 Elite sports Long sleeve rashguard is a multipurpose rash guard that excels in a variety of sports. It made from a blend of polyester and spandex which was treated by antimicrobial and antifungal treatment, which means it will stop bacterial growth. Not only that this rush guard offers modern technology, but it also offers a minimalistic design which is perfect for no gi and wearing under the gi. Also worth mentioning that this rashguard is IBJJF approved. IF you are not yet convinced, check out the price which is super affordable. 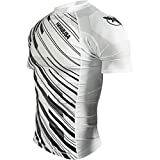 A rash guard is a piece of clothing that you wear in the upper part of your body. However, it brings multiple benefits to BJJ practitioners, besides covering your skin. We’ll begin with the name of this clothing item – rash guard. It’s called rash guard because it prevents from mat burns. Try rolling on the mat while not wearing any clothes on your upper body. You will discover that wounds will begin to appear as you roll on the mat. Your elbows will take the brunt of it, as you use them to post on the ground very often. But, if you wear a rash guard, you won’t have to deal with this issue, as it can protect your skin from mat burns. For Gi wearers, a rash guard can also protect Gi burning. The use of a rash guard can also prevent skin infections. You may not realize it, but if the mats aren’t properly sanitized, then they can be a breeding ground for disease. There are many skin diseases that spread upon contact. Therefore, if you wear a rash guard, you will have a new layer of protection for your skin. Getting a skin disease from the practice of BJJ is one of the most irritating experiences that you can have. In order to avoid it, make sure that you’re protected with the help of the rash guard. Another benefit you have from wearing a rash guard is moisture control. Sweat is another potential issue that you will do away with if you wear a rash guard. 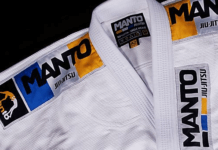 If you only wear your Gi, then you will start leaking sweat and your hands may get all sweaty. This will dramatically weaken your grips because now your hands will slide a lot easier. Rash guards will make your sweat evaporate or it can even be absorbed by your kimono. In any case, they’ll help you to have a better grip. There is another potential health benefit that you will experience by wearing one of the best BJJ rash guards. Rash guards can shorten the recovery time that your muscles need after a workout. 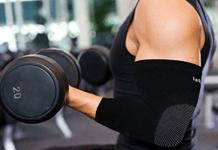 In fact, there are scientific studies that show that muscle compressions aids in muscle recovery. And if there is one thing a BJJ rash guard is good at, is muscle compression. Should you buy a Rash Guard? The answer is HELL YEAH! 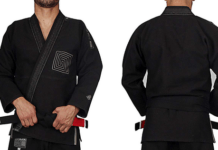 As you see, investing in one of the best BJJ rash guard presented can really be a smart investment for you. If there is one person that consistently promotes the use of a rash guard, it’s the BJJ leglocks legend, John Danaher. He wears a rash guard all the time, even when he’s not on the mats, and he swears by it. So, take the advice from the master and buy a rash guard of your own.